Okay, I admit that when I first began reading this book, I didn't like it and it took me awhile to get into it (probably because of all the English terms that we don't use in the U.S.) Then when Adam came along, I didn't stop reading. I read this book in about an hour or two since it's a really fast read. I really wish there was more detail as I wanted to get to know about Livia and Adam more and Jeff and Krystina. By the time you get to the end of the book, I really wanted to cry. It was a bit predictable in the beginning, but I didn't think what happened would have actually happened. My mouth was hanging open I was so shocked. This story really captured my heart because it's a REAL love story. Kate Le Vann portrayed what love really is and should be. Adam is a sweetheart and I am so glad that Livia ever met him. 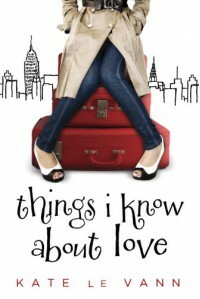 In all, this book is such a light read and the jargon takes a little getting used to, but it's such a sweet love story. I also love how it's in blog format, so it's just like you're in the mind of Livia and Adam. The Cover: I am not a big fan of this cover although I love what the girl is wearing. I think it's a little too plain.